This volume presents three major social types in American society-heroes, villains, and fools-as models for American behaviour. Approaching these models primarily through language, Orrin E. Klapp explores what they may suggest about Americans as a people. Rather than study people, the author describes abstract types named and embedded in popular language. These social types are important symbols; and a way to attack a symbol is by identifying its meaning in various contexts. He further argues that the language surrounding heroes, villains, and fools reveals a social structure. We may not escape being ascribed a type, but we do have a choice of type. Known more commonly as "finding oneself," we can manipulate cues-with dress, facial expressions, style of life, or conspicuous public roles-to build an identity. This classic study has serious contemporary implications. For a public figure, an inevitable result of the typing process is the development of at least two selves, the public and the private. When the book originally appeared in 1962, the struggle to balance two images generally only plagued celebrities and politicians. Today, social media offers everyone the opportunity to develop an online persona. This volume will be of interest to sociologists as well as anyone who has a Facebook account. 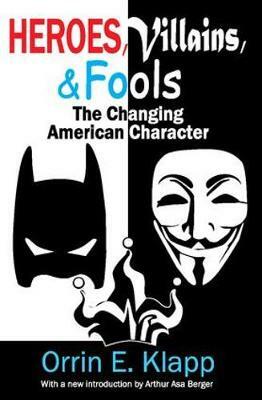 "This volume by Dr. Orrin E. Klapp presents an incisive social psychological analysis of the changing American character as it is reflected in the heroes we emulate, the villains we condemn, and the fools we laugh at. . . . It is impossible for this short review to do justice to this stimulating and challenging little volume. I urge all social scientists to read this volume and then observe first hand what is happening to American heroes, American society, and American culture." "Klapp's book deals with an area of social life which, because of it lies beyond the institutionalized statuses of formal organization, receives little attention from sociologists. . . . People see social types as examples of heroic, villainous, or foolish behavior and attempt to control their own behavior, and the behavior of others through the use of these evocative labels. The existence of social types performs several functions for society, including helping people to build self-images and contributing to general consensus. By studying commonly-used social types, we can discover the important values of a society. . . . [O]ffer[s] valuable suggestions for study of an important part of society." "[In t]his informative and vivid little volume. . . Professor Klapp has set out to describe the major social types or 'role-models' of our society as revealed by names and descriptions embedded in common speech and writing. . . . This book gives us a stimulating, and often entertaining, excursion into the possible implications of the current language of social types. . . . On the whole. . . this provocative and knowledgeable survey well repays an attentive reading."